The night journey and ascent of the Prophet Muhammad, and the revelation of Salat. The festival is celebrated by telling the story of how the Prophet Muhammad was visited by two archangels while he was asleep, who purified his heart and filled him with knowledge and faith. 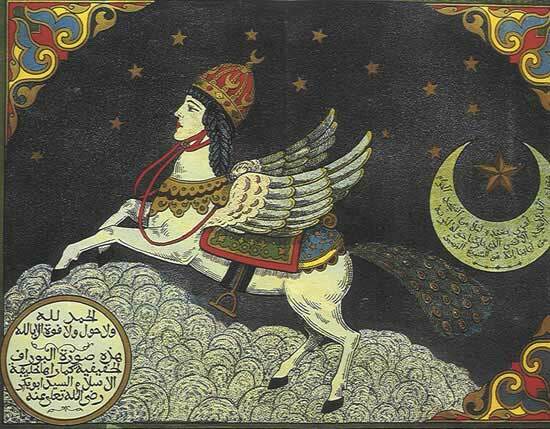 The Prophet travelled from Mecca to Jerusalem in a single night on a strange winged creature called Buraq. From Jerusalem he ascended into heaven, where he met the earlier prophets, and eventually God. During his time in heaven Muhammad was told of the duty of Muslims to recite Salat (ritual prayer) five times a day. "The story of Lailat al Miraj consists of two major parts. The first part of the story begins with the Prophet Muhammad at the Kabaa in Mecca. He is visited by two archangels who provide him with a mythical winged steed called Buraq. Buraq carries the Prophet to the 'Farthest Mosque,' believed by Muslims to be the Al Aqsa mosque in Jerusalem, where Muhammad joins past prophets in prayer. Today Lailat al Miraj is observed by Muslims as one of the most important events in the history of Islam. Muslims may attend special prayer services at a mosque, or they may commemorate the holiday privately at home by telling the story to children or reciting special nighttime prayers."